Year 8 Boys Lancashire Schools Rugby Union Vase Festival Winners 2019! 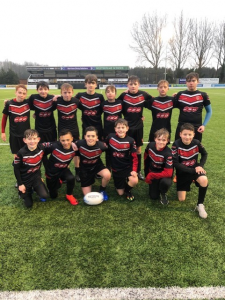 A huge congratulations to the Year 8 Boys Rugby Team who followed up their on-going success within North West and National Rugby League Competitions by also Winning the Lancashire Schools Rugby Union Vase Festival, hosted by Preston Grasshoppers RUFC. The boys went unbeaten, without conceding a try, in their 5 pool games versus Carnforth High School, St. Margaret’s, Liverpool, Standish High, Wigan, Scarisbrick Hall School, Ormskirk and Unity Academy, Burnley and then went on to beat Audenshaw School, Manchester in a ‘Golden-Point’ Final – again without conceding a try. This was a fantastic effort from a relatively inexperienced Rugby Union squad in extremely difficult weather conditions. They now go on to meet St John Fisher, Wigan in the North West Rugby League Semi-Final and have also face a difficult (and very long!!) trip to Cardiff after half-term to play Glyntaf High School in the National Cup.